The global refugee crisis has become increasingly complex as, for most of the displaced, the circumstances of their displacement severely constrain opportunities to move beyond the confines of refugee status. It is increasingly clear that the traditional approaches to addressing these issues—the "durable solutions" of resettlement, repatriation, and local integration—are insufficient to overcome the vast scale of need. The exploration of other legal opportunities whether in first-asylum countries or via migration elsewhere is imperative, as is the prudent and strategic investment to make them viable and accessible for refugees. Legal channels for migration and mobility fall within three broad streams: labor, education, and family reunion. 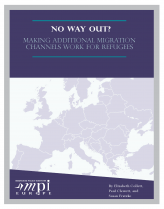 Although in theory refugees are already eligible to move through many of these channels, in reality pathways are often blocked by practical, technical, and political obstacles. This report explains how governments, international organizations, and other actors can support refugees’ paths to self-sufficiency and stability by ensuring the accessibility of existing opportunities as well as creating new ones. Private sponsorship of refugees by individuals, local groups, or faith-based organizations, for example, can bring down costs to the state and accelerate integration outcomes, and has the potential to involve brand-new actors (and sources of finance) in the international protection regime. The innovative use of existing legislation geared towards the mobility of member state nationals under regional cooperation frameworks, meanwhile, offers an alternative approach in countries where traditional protection might be politically sensitive. III. Secure Status in First-Asylum Countries: A Gateway to Mobility?